The release of WordPress 5.0 is coming up fast, and not necessarily at the best time of year. Between Black Friday and holiday breaks, there are a lot of reasons not to make an update that could potentially break your site. That said, it’s always best to be on the latest version of software, if you can swing it. 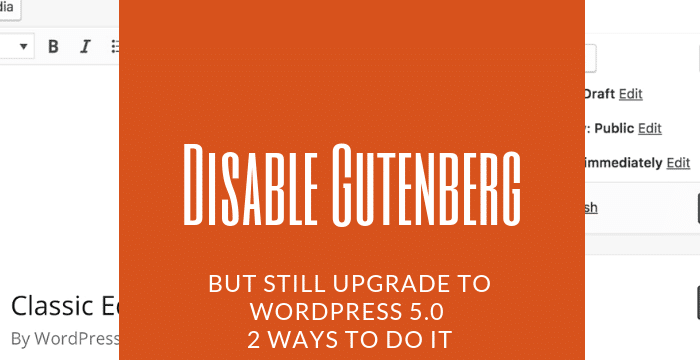 So here I’m going to tell you about 2 ways you can upgrade to WordPress 5.0, but disable Gutenberg. Conventional wisdom tells us that we should always make sure WordPress is up to date. It ensures we’re running with fewer bugs and more security patches. But WordPress 5.0 is a big change and not everyone feels it’s ready. So why would you want to hold off? You don’t have a Gutenberg-ready Theme. You run an eCommerce site and you don’t want to make any changes during the holiday season. If you’re in this camp, there’s a compromise: you can upgrade to WordPress 5.0 but disable the new editor. Here’s how. This plugin was developed specifically for people who aren’t ready for Gutenberg. It will disable the new editor while still allowing you to upgrade to WordPress 5.0. If you don’t want to mess with Gutenberg right now, this is the best path to take. Creating content will be exactly as it is, pre-5.0. This plugin will be supported through 2021. If you want a little more flexibility, Gutenberg Ramp will give it to you. Unlike the Classic Editor plugin, which wholesale disables Gutenberg, Gutenberg Ramp allows you to pick and choose where you want the new editor to show up. It allows you to enable or disable the new editor based on post type OR post ID. So if you know you want to use Gutenberg on posts but not pages, you can do that. Of if you’re using an LMS that doesn’t yet support the new editor, you can use Gutenberg Ramp to make sure the new editor doesn’t even try to load. From here, anywhere your content works, you can enable the new editor. Anything that still needs work can continue using the Classic Editor. One thing you should do (if they haven’t already communicated their plan to you) is reach out to your hosting company. Some have stated their plans to disable the new editor by default – it will be up to you to enable it. Something to keep in mind as you upgrade: you may not have to do anything. Are you going to upgrade to WordPress 5.0 when it comes out? Do you plan disable the new editor at first? Let me know in the comments!